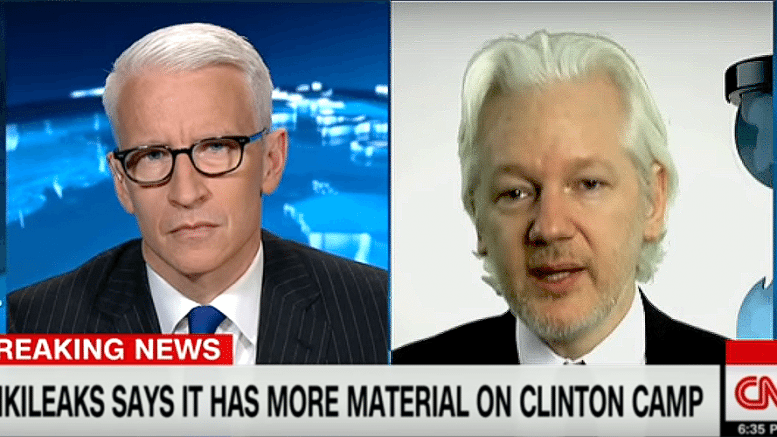 CNN talking head Anderson Cooper is doing his best to take the attention away from the damaging content of the hacked emails and the lack security that resulted in the hack by trying to make it a personal vendetta by Wikileaks founder Julian Assange against the “human security breach,” Hillary Clinton. As a totally bought and paid for shill for the leftist establishment, Cooper appears to have a hard time grasping the concept that Assange is acting purely in service to the public interest with his releases. He’s exposing to America a few of the many improprieties, irregularities and criminalities of much of the Democrat leadership. The part that seems to get to him the most is that which involves Hillary Clinton the grim reaper of American liberty. The last thing Cooper and his Democrat masters need is another guy who can’t be bought. Attempting to torpedo Donald Trump was already more than a full time job for their entire network, as well as MSNBC, NBC, ABC, CBS, much of print and online as well as the entertainment world. That’s a lot of firepower against one guy and his campaign. Now Assange has emerged out of nowhere, throwing curveballs that they might not be able to hit. He says the yet unreleased documents “are extremely interesting and we will see what will come of them in due course.” That’s what he was afraid Assange was going to say; it’s time to attack. Assange says those claims are false reporting. “I never said I wanted to harm Hillary Clinton, anything like that, it was the presenter that used that word. The New York Times has picked its candidate in this race and so it distorts the facts to try to get its candidate up. Cooper attempts to lower the nature of the releases to retaliation by Assange and fails miserably. All he does is make himself look like a petty, wholly owned tool of the DNC. He said, “So the question of anger, that you’re interfering in the US election, you’re saying that your readers are American and therefore it’s okay? That’s a most idiotic, inane question, implying that Clinton’s criminal activities and those of her cohorts can’t be reported on except in the country of her offenses? Does CNN not have an international news division? Assange, being the gentleman that he is didn’t point out the clumsy way his questioner attempted to diminish him and kept on point. The response involves some concepts that surely had Anderson Cooper’s head spinning, like honest reporting and principles. He continues telling the apparently befuddled Mr. Cooper, “If we don’t understand what our institution’s doing we have no hope to reform them whatsoever. Cooper missed multiple opportunities to hone his investigative skills when Hussein Obama was inserting himself into the Israeli elections to attempt to unseat Benjamin Netanyahu. But he works for Obama as well, so just like everything else Obama and Clinton get a pass and the little twerp comes out attacking the good guys who are exposing corruption and bias. Isn’t that what Cooper and the rest of the media are supposed to be doing? Clearly he could learn a lot from Julian Assange and Wikileaks – as we all are about to learn a lot from them, about Hillary Clinton.